Audrey Babcock in CARMEN. Photo by Dan Norman. The summer opera staged each year in the Mill City Museum courtyard by Mill City Summer Opera company has become one of the premier outdoor events in the Twin Cities often playing to sold out audiences. On preview night, the media were given a tantalizing taste of this year’s offering, Bizet’s Carmen. First off, the courtyard is a fine setting for this opera, set in Spain. The jagged limestone remains of the mill serve as a perfect backdrop for the outside of a cigarette factory, a mountain hideaway and in the final scene, the exterior of a bull ring in Seville. However the evening didn’t start out terribly well. Tenor Adam Diegel as Don Jose in the male lead role was ill and his place was taken by director Fenlon Lamb walking through his part and a woman offstage reading (speaking) his lines making the chemistry between Carmen and Don Jose impossible to judge. …then the rain started. It turned into a downpour and twenty minutes later with the sky still dark overhead the rest of the show was cancelled. What I was able to see of the production was a tantalizing appetizer. 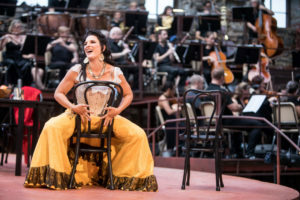 This Carmen is a steamy treat for a summer night.